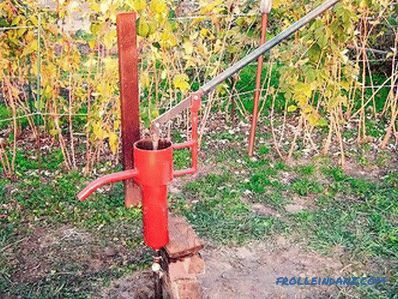 Not everyone is able to organize an automatic water supply system for a country house, which includes the installation of pumping equipment. Often the main problem is financial, because for the implementation of such a project will have to spend considerably. As a result, many have to come to terms with reality and carry water in buckets from a well for watering and other needs. However, some such prospect leads to the search for an alternative solution. For example, install a hand pump for water from a well. This is an ideal solution to automate the process of water supply. Although it is difficult to get a large amount, it is better than carrying full buckets from a nearby street or carrying from somewhere, which is even worse. 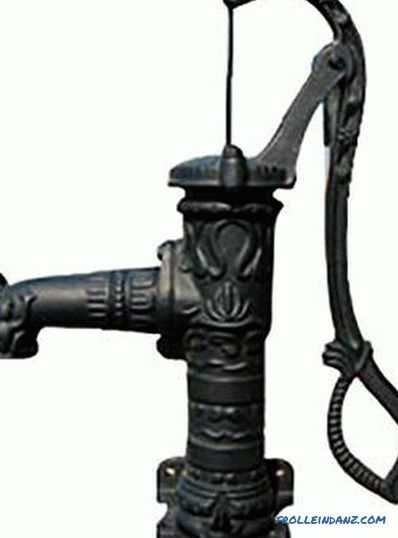 In this article we will tell you about the existing types of hand pumps. Looking ahead, we note that there are 4 main types of them, among them are piston, sucker-rod, membrane and wing. 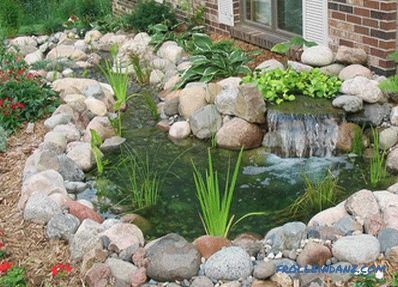 We consider the features of each of them and be sure to talk about the arrangement of the well. In addition, instructions will be provided on how to make such a pump yourself. But first, let's get acquainted with the features of this equipment. 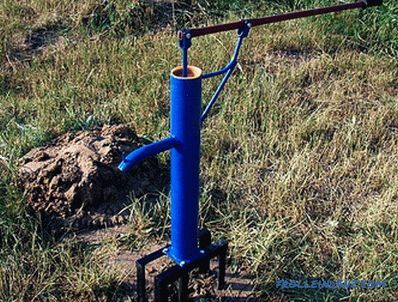 A hand pump means a special device that pumps liquid to the surface from a well. Physical effort is needed to act on the lever mechanism. Unlike the automatic type, the flow rate of water is much lower. But this lever mechanism has advantages over its counterpart. If at the cottage there is no electricity supply, then you will have an uninterrupted source of water, including clean drinking water. There is no need to use expensive equipment. Water transfer takes place only after pressing the lever mechanism. Installation is possible under almost any conditions. Low level of performance. Unlike analogs, the flow of liquid to the surface occurs in a very small volume. If some knots fail, they are easy to replace. Unlike analogs (electrical devices), the hand pump costs much less. With a strong desire, you can do it yourself. It is enough just to complete the installation. Although such a device for a well can be made independently, most decide to buy finished products. This is explained by the fact that welding is used to manufacture the pump. 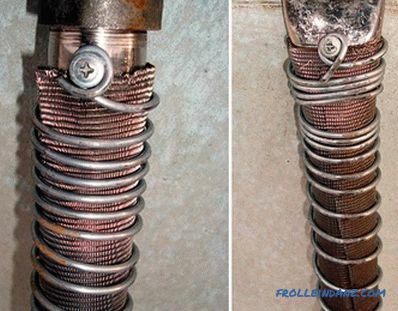 Not everyone is able to perform a high-quality weld seam, as a result, the design efficiency is reduced to zero. Today you can often meet in the courtyards or in the private sector intake columns. Such columns have nothing in common with manual mechanical pumps. Why? In conventional columns, the water pressure is created by the pressure in the city water line. In a mechanical pump, pressure is created by means of pressure, which must be constantly pumped up by applying physical force. Piston pumps are used for sources up to 10 m deep. 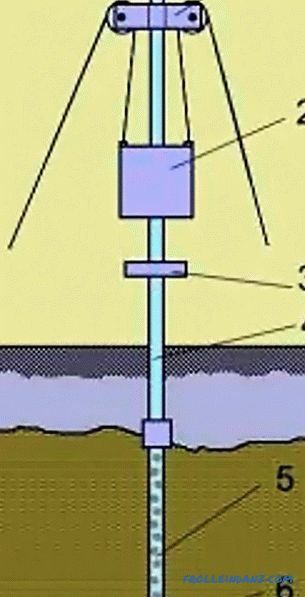 If the depth of a well is 30 m, then sucker-rod devices are ideal. Membrane is mainly used for pumping water in water supply systems. As for the winged hand pumps, this is the most expensive device. It is a rotary mechanism in a housing with a suction pipe. Also, hand pumps differ in operating mode and production materials. For example, some models can be operated only in the summer. Cases of such pumps can be made of plastic. There are also metal models of devices that should be insulated for operation in winter. 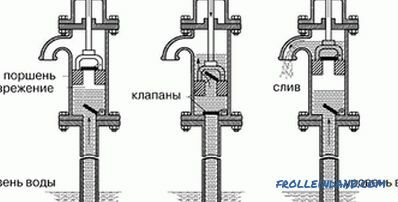 Now we invite you to become more familiar with all types of similar devices used to lift water from a well. as already mentioned, the piston pump is used in cases where the water mirror is high. The maximum allowable limit for it is 10 m. If the mirror is deeper, the pump will not be able to lift the liquid to the surface. At the base unit is a special piston, which is the main working unit. The piston itself is placed in the pipe and connected to the bottom of the device. Under the influence of forces on a special lever, the piston moves up and down. As soon as the piston is in the water, it flows through the valve into the over-piston space. When the piston is raised, it is pushed through the outlet pipe. stem outgoing inside the cylinder. The piston is located inside the liner and is activated by a lever mechanism. Stock - partly visible from the outside. From below, a pipe is connected to the pump through a nozzle. Valves located on the piston itself. 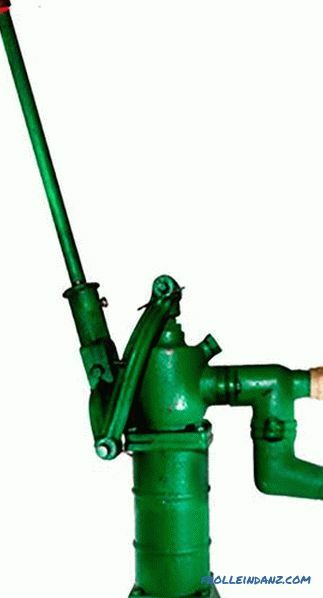 It can be seen that the pump has 2 valves: one on the movable piston, the second on the stationary part, which opens and starts the water under the influence of pressure. If it is not, then pumping out the water will be problematic. 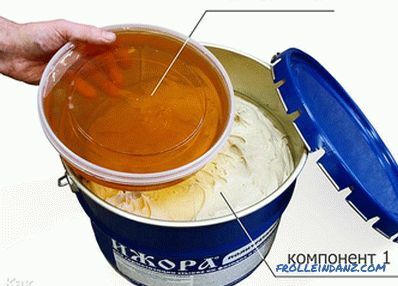 Usually, after using the pump, a small amount of liquid remains inside, as can be seen in the figure on the left side. When the piston is lifted up, the valve opens, thereby filling the inner cylinder. In the center image, it can be seen that when the stem with the movable piston is lowered, the bottom valve closes. At the same time, the valve on the piston opens and collects fluid for its subsequent raising upwards. When the piston is fully lowered down the cylinder, the water is completely supplied from the lower chamber to the second. 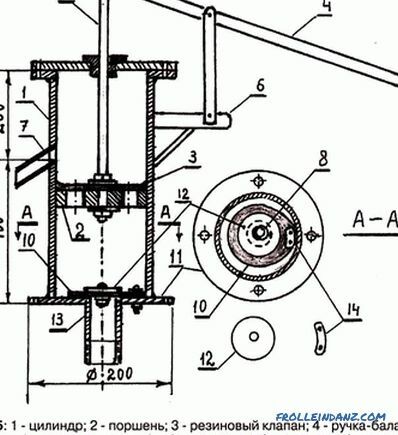 Now on the diagram on the right side we see that the valve on the piston is closed, and the water goes out through the nozzle. As you can see, the scheme of work is very simple. The only nuance of this pump is that during intensive use, rubber seals on the piston wear out quickly. Sometimes valves fail. If the liquid contains fine impurities, then wear increases. With regard to performance, measured in liters of liquid, lifted at one time, it varies depending on the model. The internal diameter of the cylinder, that is, the volume of water that is between the first and second valves, mainly affects the performance. piston (piston has a disc-shaped form). Differential. These are double-acting devices, they have 2 chambers (the first chamber has one valve, the second chamber has suction and working valves). Double acting. In contrast to the differential action, in this case water flows evenly. The design has 2 working chambers. Pumping fluid piston is carried out for 2 turns. These devices also differ in the number of pistons. There are pumps with pistons of small and large diameter. Having dealt with the principle of operation of this device, it's time to talk about how you can do it. Many gardeners immediately consider this option, wanting to save money. The first step is to make the pump casing.This will require a metal cylinder, for example, some use a fire extinguisher, a piece of pipe, a liner from a diesel engine, and the like. The length of the segment should be up to 80 cm. It will be good if you can properly clean the inside of the pipe from irregularities. This will ensure the piston is a good move. If you use a piece of pipe, you should cut the cover out of thick metal. In the cover must be made hole for the rod. If you use a used fire extinguisher, then its upper rounded part is ideal for the future hand pump. A metal rod is used as a rod on which to fasten piston. The piston is made several holes through which water will flow. A tight rubber should be attached to the top of the pistons. But not so dense that it can not miss the water, because when the piston moves down, the rubber should perform the function of a valve. So now you need to attach a piston with a valve to the metal rod . It is immediately inserted into the body of the future pump. A hole is made for the installation of the drain spout. Ø1 / 2 pipe can be used. A fitting for feeding should be welded to the bottom. A rubber valve in the form of a petal is also fixed to the hole in the fitting inside the housing. He will hold the water in the first chamber. These are the main processes for the manufacture of a piston pump. Also, secure the lever to raise the piston. All processes include welding, therefore, sufficient qualification is required. We suggest you to consider in more detail the manufacturing process in the video. The working cylinder is located directly in the water column. To install such a pump, a well with a casing is required. 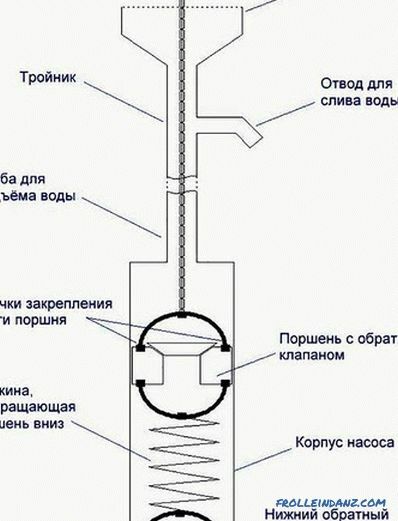 The working cylinder with the main part is connected to a pressure pipe, inside of which there is a rod or rod. It is he who drives the piston. As for the presence of valves, there are also 2 of them, the first is located on the intake manifold of the cylinder, and the second on the piston. On the basis of this scheme, it becomes clear that the upward flow is not just a method of suction. The working cylinder located in the aquifer creates a pillar. Each piston movement up and down creates pressure, replenishing the existing column with a new volume of fluid. According to this scheme, the water can be raised even from a depth of 30 meters. If we compare the piston and the rod assembly together, when using the latter, it is required to put more effort into raising water to the surface. For this reason, the pump lever is often made elongated. This allows for less effort to achieve maximum piston stroke. Similar installations are more difficult. This also applies to installation work and subsequent maintenance. 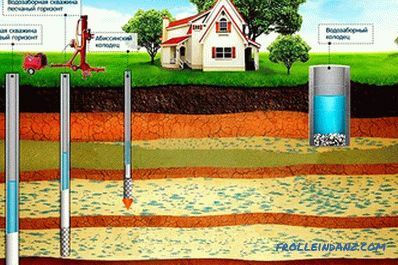 However, if there is no electricity at your summer cottage, and the aquifer is located at a depth of 25-30 meters, then the rod pump is simply indispensable. By such a pump is meant a special chamber, which is divided by an elastic membrane. Hence its name is membrane. It can be used to raise the water from a depth of 6 meters. This device has a round case, above which the handles are located. The internal movable partition is connected to the handle. The design of the pump has an air chamber, it does not participate in the transfer of water. At the bottom of the device there are 2 connections. One of them is connected to the suction through the valve. The other serves as a supercharger. When the membrane presses down, the pressure in the chamber where the fluid is located increases. This causes the valve to open.When the stem is raised, the membrane also rises. Under pressure through the check valve water runs. So, one valve is on the suction pipe, and the second on the exhaust. Metal or cast iron is used to make them. One of the weak points of this pump is the membrane. With frequent use it quickly breaks. Moreover, over time, the membrane stretches and becomes elastic. Because of this, performance drops to zero. Water can see through the hull if the membrane breaks through. 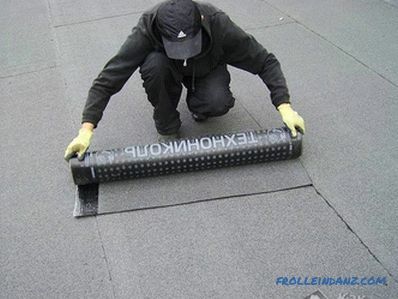 Replace the membrane does not make any special problems. But even so, diaphragm hand pumps have not been widely accepted. 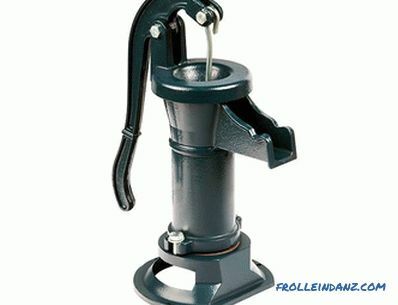 To set the impeller in motion, a handle is fixed and rigidly mounted on the shaft. If the pump will not be used in winter, then there is a plug on the body, by unscrewing which water can be drained. The inside should be thoroughly rinsed with hot water. This is necessary, because there is a conservation lubricant applied. During the flushing process, the plugs from the suction and discharge nozzles should be removed. Next, you need to install the handle. Using 2 bolts, the pump should be fixed vertically. After the pipeline is connected to the suction inlet. Under the influence of vacuum the pipeline should not be deformed. Therefore, the ideal solution would be to use a metal pipe. By the same principle, the pressure pipe is also attached to the pump. Please note that there is an opening in the pressure pipe through which fluid is poured into the device. If the water intake depth is more than 1 meter, then a check valve is mounted on the suction pipe. It will ensure the normal operation of the pump. It is equally important to ensure the complete tightness of the suction pipe. Otherwise, the device will not work normally. The main disadvantage of the vane pump - small performance. That is why it is rarely used in the household. He copes with a small amount of water. An important selection criterion is the depth of the well. This figure is compared with the parameters of the pumps. It is also important to know the capacity, namely how much water it can deflate in one cycle. The casing diameter is taken into account. Here it is important to keep in mind one thing: if the diameter of the casing is less than 100 mm, then you will not be able to insert a pump rod pump assembly into it. You should know the degree of contamination of the source. Usually in the passport to the products indicated technical indicators. Evaluate your strengths, if you manage to lift water from a great depth yourself. 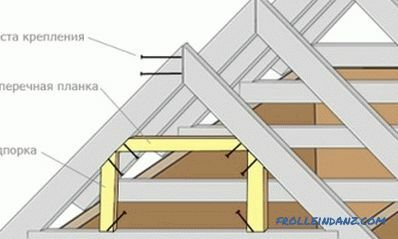 Differences in installation methods. Therefore, immediately think about what installation method is acceptable in your case, for example, it may be a fixed installation or a temporary installation, which means dismantling at the end of the warm season. The appearance also plays a significant role. The case of the device is made of stainless steel. 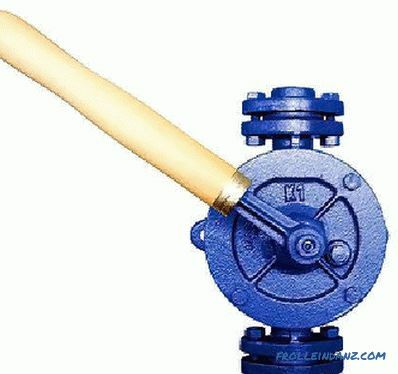 It is mainly used for pumping water from wells, wells, reservoirs with a water mirror not exceeding 8 m.During operation, the check valve must be installed. 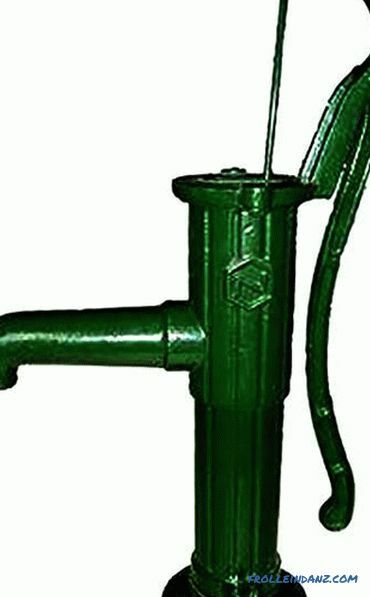 The height of the pump with a raised stem 0.75 m. The diameter of the connection to the pipe and the output hose is 1 inch. 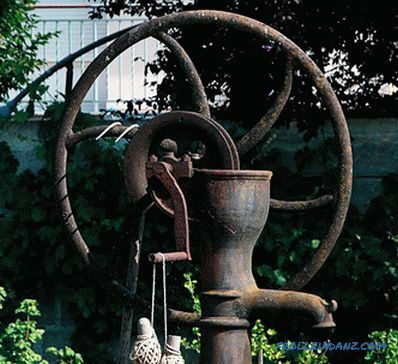 At one time, the pump pumps out a volume of 1.25 liters. Operation is allowed at a temperature not lower than + 5 ° С. Dimensions of the device 750 * 500 * 125 mm. 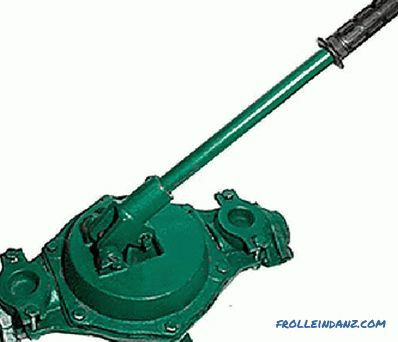 Used for pumping water from wells, wells, ponds and other tanks. The piston and cylinder of the unit are made of high quality plastic. Piston ring and rubber valves. Other metal elements. This model is suitable for raising liquid from a depth of not more than 2 m. However, it is also possible to operate at a depth of up to 9 m if a check valve is installed on the pipe at the bottom of the suction line. This pump weighs 5.5 kg. 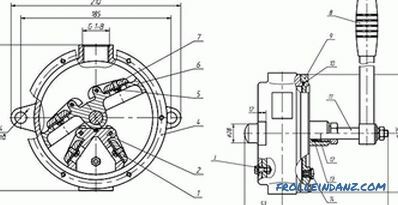 Dimensions of the device 540 * 180 * 550 mm. The diameter of the inlet and outlet nozzle 3/4. In the region of 2500 thousand rubles. 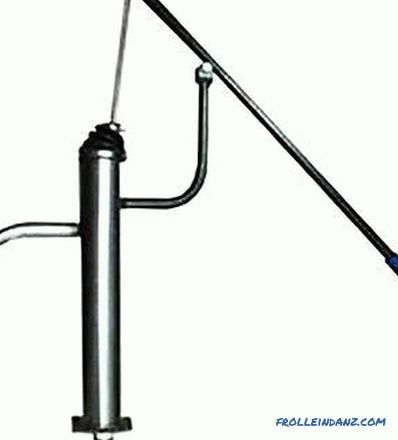 This piston hand pump is operated when raising water from a depth of not more than 9 m. The device case is made of stainless steel. Holder, black steel handle. Predominantly colored green. A check valve is installed on the suction side. In one cycle (down-up) pressing the lever produces up to 1 liter of water. 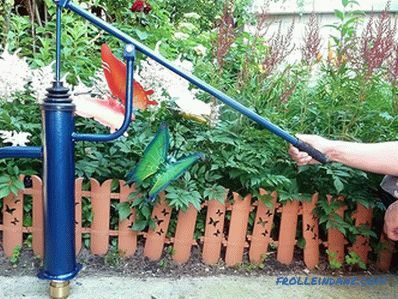 The length of the lever allows the pump to be used by older women and those with little power. The dimensions of the pump are 1000 * 150 * 870 mm. The unit has a weight of 8 kg. In the region of 6.5 thousand rubles. 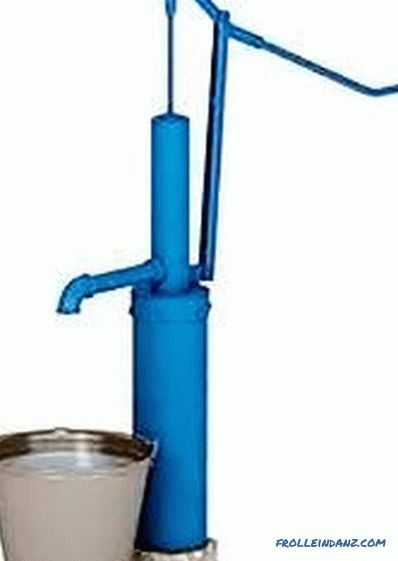 It is used to raise the fluid from wells and wells. The aquifer mirror is not more than 6 m. If you install a check valve on the suction line, you can raise the water from a depth of 9 m. The height of the unit with a raised stem 40 cm. With an intense pressure on the lever, you can lift 22 l / min. Dimensions of the device are 390 * 240 * 200 mm. The total weight of the unit reaches 7 kg. Like its counterparts, used for pumping water from wells and wells. When using a check valve, water can be raised from a depth of up to 9 m. The body of the pump is made of cast iron. Feed is 28 l / min. The device parameters are 650 * 240 * 160 mm. The total weight of the hand pump is 15 kg. From 4 thousand rubles and more. Used pump for pumping water without abrasive particles. The suction height is up to 9 meters, provided that a check valve is installed at the end of the suction pipe. 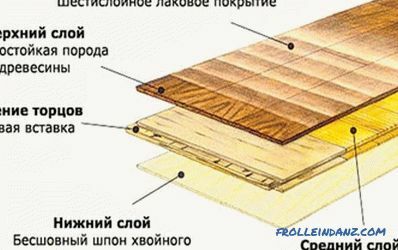 Depending on the model, from 3 to 30 thousand rubles. 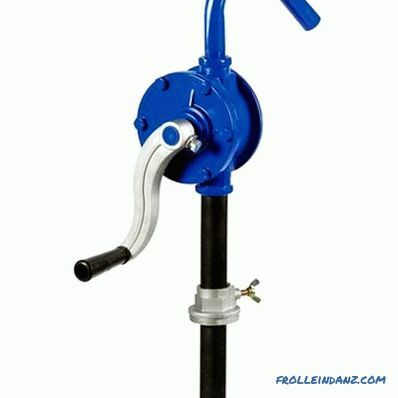 A piston hand pump is used for pumping fluid from wells, wells and reservoirs. Vertically able to lift water from a depth of 15 m under pressure up to 1.5 atm. At installation of the backpressure valve height of absorption is up to 9 meters. With the stem raised, the height is 64 cm. 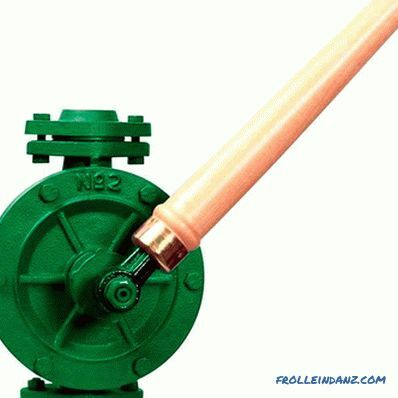 In the delivery set you will receive a semi-disassembled pump, a handle and a fitting for connecting a suction pipe with a diameter of 25 mm. Dimensions of the device 530 * 240 * 160 mm. Weight 16 kg. Feed 28 l / min. 6.5 thousand rubles and more. Operation is possible for both clean water from a well / well and polluted water. 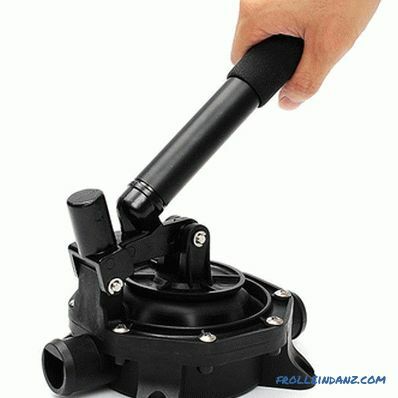 Diaphragm hand pump does not require pre-filling and is able to lift water from a depth of 6 meters. The body and the pipes are made of cast iron. Valves and oil-resistant rubber membrane. Dimensions of the device are 250 * 250 * 650 mm. Installation weight 13.5 kg. Productivity is 50 l / min. From 7 thousand rubles and above. With minimal physical effort, this pump can lift water from a depth of up to 9 m when using a check valve at the end of the suction pipe. The body is made of cast iron using artistic casting. The pump is fastened using a flange. The height with a raised stem is 62 cm. There are 2 types in this series of BSK for mounting on the wall and BSKG for mounting on the floor. In the first case, the BSK capacity is 28 l / min. Its dimensions are 600 * 240 * 160 mm with a mass of 15 kg. The only difference between its counterpart, is the performance, which is equal to 30 l / min. They have a slight difference in cost. Used to raise from a depth of no more than 16 meters. For a double stroke of the handle gives up to 1 liter of water. The sucker rod pump itself plunges to a depth of 16 meters and pushes the fluid out. The weight is 127 kg with dimensions - 17560 * 230 * 1430 mm. 27.6 thousand rubles and more. Here are a few common variants of manual pumps that will satisfy the water needs of your summer cottage. 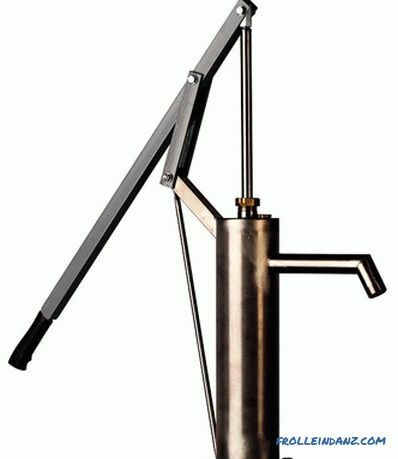 For a hand pump, making the Abyssinian well or well would be an ideal solution. Typically, these wells reach depths of up to 9 meters. Based on these parameters, most of these devices were developed. At such a depth, a good aquifer is usually located, which makes it possible to provide a suburban area of ​​drinking water. Moreover, this it can be used for construction work. 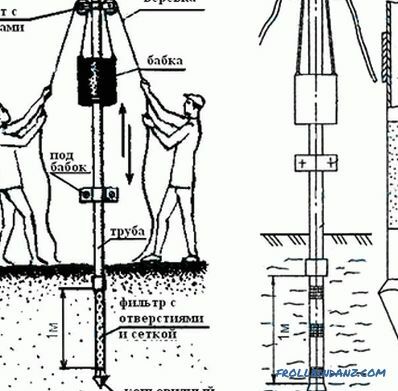 If you watch a video about the making of an Abyssinian well, you will immediately notice that it is realistic to make it yourself, however, there is a possibility that you will not cope with the task. And the reason for this is not the fact that you are a bad master, you may simply not be able to find water or other problems arise. You can make sure of this by viewing the video where all the rules of work are observed, but the home craftsmen failed. As you can see from the video, all the subtleties of the work were observed, but as a result the pipe could not be driven, it broke off. Although it is allowed the fact that there simply was not enough experience in the implementation of these works. Moreover, part of the pipe remained in the soil. Given this, it is worthwhile to think carefully and weigh the pros and cons. An important condition for the manufacture of an Abyssinian well is the composition of the soil. It should be predominantly sandy or consist of a mixture of rubble and sand. If you have a rocky soil, then you will not be able to break through to the bottom, unless you make the rig yourself. However, not everyone can do it. Therefore, in most cases, wizards are called to help. If the ground is predominantly sandy, then the work on the production and arrangement of the Abyssinian well can be done personally. Therefore, later we will tell you about the driving technology, because the drilling rig is mainly used by specialists. On this topic you can watch the prepared videos. Today, the cost of producing a well will cost you a little over 20 thousand rubles. In this case, you will not need to rent a large amount of equipment. Usually, experts come by car and bring all the equipment in a small volume. 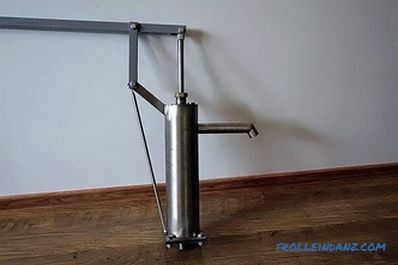 If you decide to make a well yourself, in general, the assembly and preparation of the necessary equipment will not cost you as much, unless you decide to make a homemade drilling rig. If the driving method is chosen, then it will take about 10 thousand rubles to purchase the necessary equipment. Although it will take a lot of effort, the result will not leave you indifferent. There is no need to construct a tripod and a derrick. In the territory of the Russian Federation, the aquifer lies at a depth of 2 to 15 meters. If the soil is predominantly sandy, then it can be made by two strong men in one day (in some cases in a few hours). Moreover, if a drill gets stuck or rests against a stone, it is easy to remove it yourself. But there is also a bad experience when the pipe may break (about this you could see in the video above in the article). If your home is far from the city, then it is quite possible to find good water at such a depth quite be drinkable. At the same time, in terms of quality, it will not yield to water located in deeper aquifers. If all the conditions for manufacturing are met, the service life may be about 30 years, provided that water does not run out. Therefore, the duration depends on the source debit. This is probably the main advantage of the Abyssinian well. For its manufacture does not need to get permission. Permits are required for the artesian well, and are not needed for the Abyssinian well. First of all, you need to study the geology of your area. If your neighbors live next to you, then you can ask them about the condition of the soil and how deep the water lies. Problems will not arise if the aquifer lies at a depth of not more than 9 meters. If the depth is greater, then using a hand pump is problematic. The predominantly aquifer consists of medium-grained sand or fine gravel sand. It is through such a ground that the water will flow well. 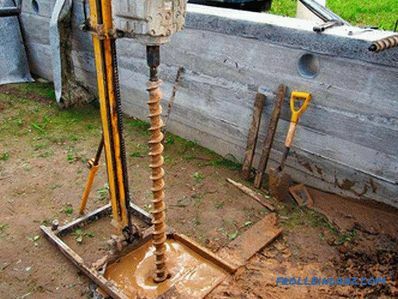 Now it is important to determine which method is best to drill piling or drilling. If you decide to make a well yourself, then a suitable option is to drive down. To do this, use the "drive woman". However, there is always the chance to pass by the aquifer. And if at the depth there is a stone, then the whole structure can be damaged. 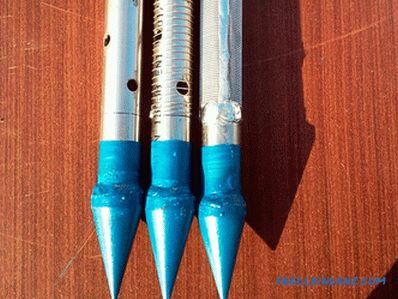 If the drilling method is chosen, then it is better to contact the specialists. In this case, you have a great chance to get an Abyssinian well with water. You can watch videos where this method is demonstrated. We also suggest that you familiarize yourself with the technology of making a well using the production method. Due to this, you can compare all the labor costs. A needle is a steel cone or point . The tip can be made independently on a lathe or ordered from a master. The needle diameter should be 20 mm larger than the diameter of the pipe to be installed. Length not less than 200 and more than 300 mm. The needle is soldered to the pipe or twisted along the thread. If you decide to solder it, then you can not use lead (you can poison the water). For solder should take tin. It does not let the sand into the pipe with clean water. The filter in the form of a pipe is placed on the very bottom of the well. You can make it yourself, you will learn more about this. They are threaded together with a coupling. But it is important that the connection is tight. For convenience, one section of the pipe should have a length of no more than 1 meter. After the well has been manufactured, a hand pump is installed. If funds allow, you can install an electric one. For manufacturing, you will need a pipe 110 cm long and 1 inch in diameter. At one end of the pipe can be soldered or welded needle. Alternatively, you can cut the pipe and flatten the end. In the pipe it is necessary to make holes of Ø13 mm in 50 cm increments in a checkerboard pattern. Next, a filter metal mesh is applied and tightened with clamps every 10 cm For this, you can use stainless or galvanized wire Ø3 mm. 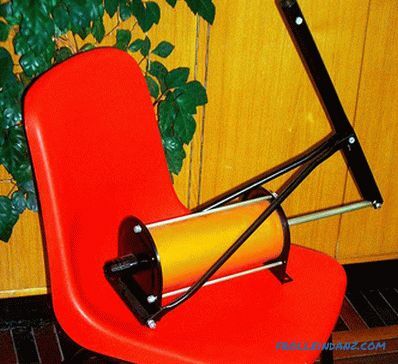 This is how you can make a homemade filter. Of course, if you have the time and materials for this. First you need to find a place to drill. After that, it is necessary to dig a pit with a size of 1 * 1 m and a depth of 1 m. Although this is not necessary. But if you plan to use the well in the winter period of time, then it is better to make such a pit in which you can make the pipe and pump warming. After you should start driving the main pipe. To begin with, a garden auger twirls into the ground in such a way as to remove the ground from the well. After that, a driven metal pin is used, which is inserted inside the pipe. This technique is relatively time consuming. You can use the "sliding grandmother. "It can be seen in the diagram below. The tip is strongly hammered into the ground and gradually deepens in the middle of the pipe. When the first pipe has completely entered the soil, another one is wound onto it and the work process continues. To make the highway easier to pass into the ground, water can be poured into the pipe, which will soften the soil. If water starts to run, the line should be thoroughly flushed under pressure. This will break the clogged filter. To test the operation of the finished Abyssinian well, install a hand pump. Here it is important to pump the water until it becomes transparent. This is the technology used for the Abyssinian well followed by the installation of a hand pump. The surrogate that holds the pipeline. 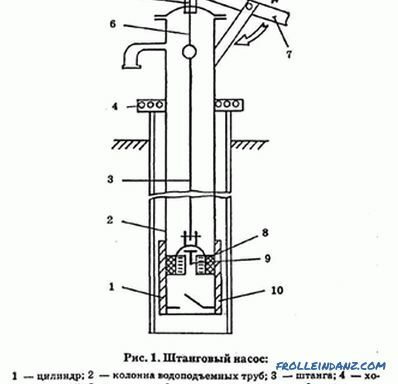 So with you we looked at the features and varieties of manual pumps, the possible options for ready-made pumps for the dacha well, we studied the characteristics of manufacturing Abyssinian well. If you have personal experience in conducting such works, be sure to leave comments at the end of this article.